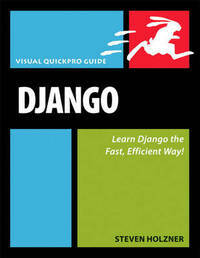 DJango is a open source web application framework written in Python. It follows the MVC (model view controller) design pattern; this software design pattern separates business logic from the user interface making it easier to make changes to the logic or interface without affecting the other. Django's primary goal is to ease the creation of complex, database-driven websites. The framework emphasizes reusability and "pluggability" of components, rapid development, and the principle of DRY (Don't Repeat Yourself). Python is used throughout. Django: Visual QuickStart Guide starts at the beginning and moves web designers quickly along the path to developing Python Web applications with Django. After introducing readers the idea of Model/View/Controller applications and why Django is the right choice, the book walks a reader through creating their first Django Web site. It goes on to cover the ultra-cool things that can be done with Django to create robust Model/View/Controller applications. Steven Holzner (Ithica, NY) is an award winning tech author. He's written several books including Beginning Ruby on Rails, Ajax for Dummies, and PHP: The Complete Reference. He is also a former faculty member at Cornell University and MIT.